In the past three years Gunbalanya Families as First Teachers (FaFT) has tripled its attendance, reflecting strong community involvement in the teaching initiative. Families as First Teachers Educator Louise Cooke, who has worked in remote Territory communities for nearly 15 years, said it was encouraging to have about 69 children enrolled in the program. “Over the past three years we have worked hard to build trust and strong relationships with our parents and the community,” she said. Louise also recognised the important role that Learning on Country activities at FaFT can play in keeping parents and children engaged. “Last time we went out bush we saw lots of language being used, and lots of interactions taking place,’’ she said. Aboriginal Family Liaison Officer Michelle Bangarr, who has also worked in education for nearly 15 years, said that on-country learning was pivotal to creating strong connections with the community. 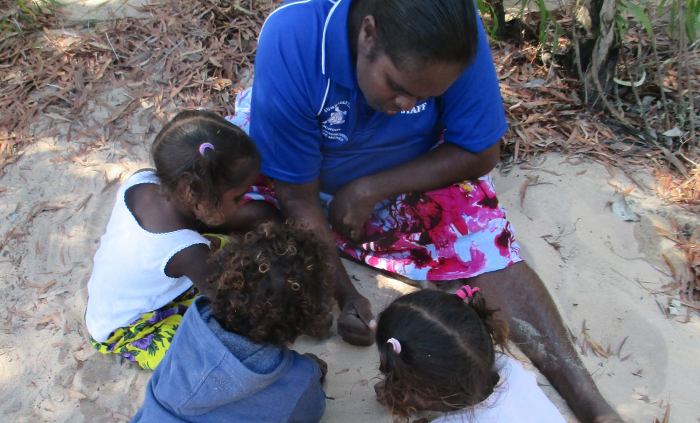 “We go on bush trips to help the children and parents share learning time together,’’ she said. The community has also worked hard to maximise the number of children who transition from FaFT into the preschool, with 24 out of 30 preschool enrolments in 2018 coming from FaFT. Last year, 92 per cent of children aged 0-4 years who live in the surrounding area enrolled in FaFT, highlighting the program’s popularity amongst families in the community. FaFT operates at 38 sites in the Northern Territory including urban, remote and very remote communities. In 2017, 1661 children and 1676 families were supported by the program, which also has strong local employment focus with about 57 per cent of FaFT staff identifying as Aboriginal.